If Vitamin A Capsule Supplementation is cheap, then why do we need bio-fortified food? “Biofortification is more cost effective because a seed can be passed on to your neighbors”, says Howarth Bouis of Harvest Plus. He tries to compare the cost categories of Vitamin A capsule supplementation program vis a vis breeding crops to increase their nutritional value, also called biofortification. The former which cost about USD0.2–0.3 / per capsule is relatively cheap; however, the intervention has to be implemented each year to Vitamin A deficient target groups. “Whereas the latter is more sustainable, because you pass on to the community the breeding of bio-fortified seeds”. With the power of agricultural research, germ plasms of Vitamin A rich food sources such as cassava, maize and orange sweet potato has been developed and released for adoption. Howarth Bouis There is no proof yet The only proof of assessing the adoption of bio-fortified food is efficacy trial to control groups, adds Howarth Bouis. Apparently, the impact of promotion to a larger public is not yet known. According to him, three important questions still remain; first, can breeding increase nutrient to levels that improve nutrition? 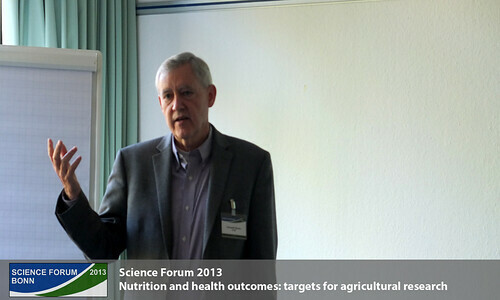 Second, are extra nutrients bioavailable at sufficient levels to improve micronutrient status? And lastly, will farmers adopt crops and consumers buy and eat these? Pilot delivery of orange sweet potato Efficacy trial of orange sweet potato has been conducted in Mozambique and Uganda to promote bio-fortification adoption. The goal of the program is to reduce Vitamin A deficiency among mothers and young children. The result shows that there have been evidences of household adoption of up to 68%. More importantly, a 100% increase in Vitamin A intake on infants, children and women have been recorded. Linking bio-fortification programs to value chains According to Alan de Brauw of IFPRI, there was no value chain created for the project and the idea came at the later stage. He emphasized that marketing should be integrated in bio-fortification programs. In the case of orange sweet potato, the market for vines and outputs (sweet potatoes) including marketable surplus are needed.